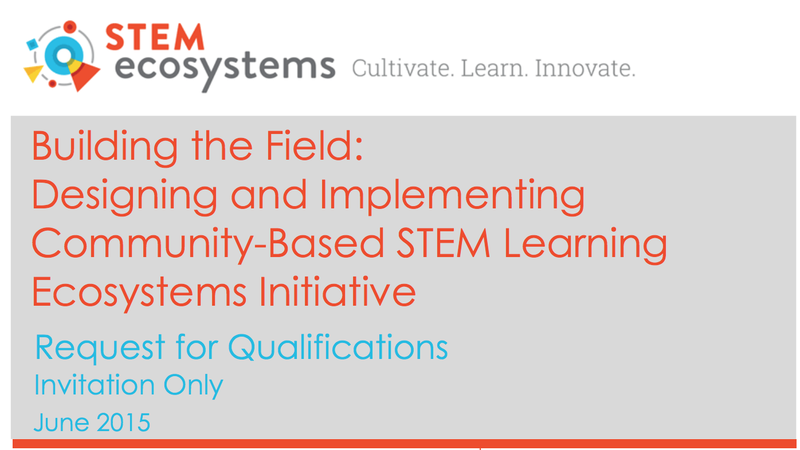 The STEM Learning Ecosystems RFQ was released on June 10, 2015. A group of ecosystem stakeholders joined a call to learn more. The RFQ was by invitation only (one invitation per city), and will culminate in a cohort of 25 cities nationwide, each of which is at various stages of cultivating their own STEM Learning Ecosystem. Information about the RFQ may be found here, and you may view the RFQ document here. As we begin this phase of the work and respond to the RFQ, we want to emphasize that this group maintains an open door policy, and ALL are welcome to participate! Inclusivity is our most important value. We rely on our partners to help spread the word and ensure that everyone within our ecosystem is connecting, since there are likely many organizations doing great work that we’re not aware of. So, please share this information far and wide, and join us to help shape Chicago’s STEM Learning Ecosystem! This entry was posted in Uncategorized and tagged ecosystem, RFQ. Bookmark the permalink.